Peak Oil is referred to as the maximum level of oil production – notionally of the world – that is expected (or has passed). There has been much talk of Peak Oil over the years – however, the world seems able to produce ever increasing quantities of liquid oil as new technologies and methods are developed to extract oil – for the time being at least. Early Peak Oil Warning: When oil prices sky-rocketed from $9/bbl in 1999 to $147/bbl before helping precipitate a financial collapse in western developed nation, people rightly questioned whether this was the effects of Peak Oil. After all, it was noted that conventional crude oil production had not increased since 2005 at the time – and the huge new increase in Chinese oil demand had significantly tightened the difference between oil supply and demand by early 2008 in the run up to the Beijing Olympics. Parallel Quiet Revolution: Meanwhile starting around 2005 there was a revolution occurring fairly quietly in the USA – this was fraccing of very low permeability shale for gas production purposes. It created abundant and fairly low cost new supplies of natural gas that started increasing the US gas supplies in 2005 driving down the gas prices from a high of $12/mmbtu in early 2008 to $2.5/mmbtu in late 2009. This gas price crash was a mini-crisis for gas producers, but what these companies had learnt by then was that the associated light oil-condensate produced in association with the gas was valuable and produced at quite high rates along with the natural gas. There were also parts of the shale formations that were more light oil prone than gas prone – and these same companies then started targeting light oil rich formations within the original shale gas plays. This became a very successful strategy – and before long – large swathes of acreage firstly in North Dakota then Texas started producing large quantities of oil that inundated the infra-structure to such an extent, that oil producers found it difficult to export it out of North Dakota – the pipelines were full and the rail terminals could not handle it. Cushing in Oklahoma – a large tank farm – was inundated with new oil – tanks brimming – and the local oil prices went down to minus $8/bbl compared to benchmark international Brent oil prices. This marked a remarkable turnaround of fortunes for onshore US gas and oil producers. This was also under the cloud of the offshore Deepwater Horizon tragedy – loss of life and massive oil spill. The onshore oil and gas developments proceeded apace despite increasing regulatory oversight. Outcome: The bottom lines is – UK gas oil-gas development is untried, untested, and is unlikely to get any momentum in the next five years. North Sea Production Crash Raised Prices: Meanwhile the North Sea oil production has crashed from 2.8 million bbls/day in 1999 to 0.7 million bbls/day today. Gas production has also crashed to 40% of its 1999 levels. 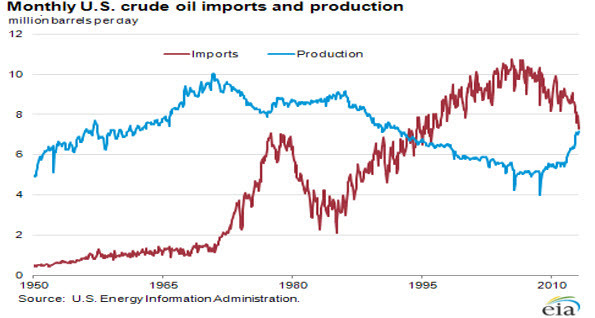 Oil and gas imports have risen sharply. With it, energy prices have skyrocketed. Just when we need low cost gas like the USA, this is being stopped in its tracks and import bills are rising annually. The last two governments have hiked North Sea energy taxes three times – the last one in March 2013 precipitating a collapse of 23% in oil and gas production in the following 12 months despite very high oil and gas prices. The Coalition killed the goose that lay the golden egg. Contrasting Fortunes: We thought it was worth contrasting the fortunes of the US and UK energy industries –m because this will have a massive impact on their respective economies in the next ten years that will start to show moving into 2014 and beyond. 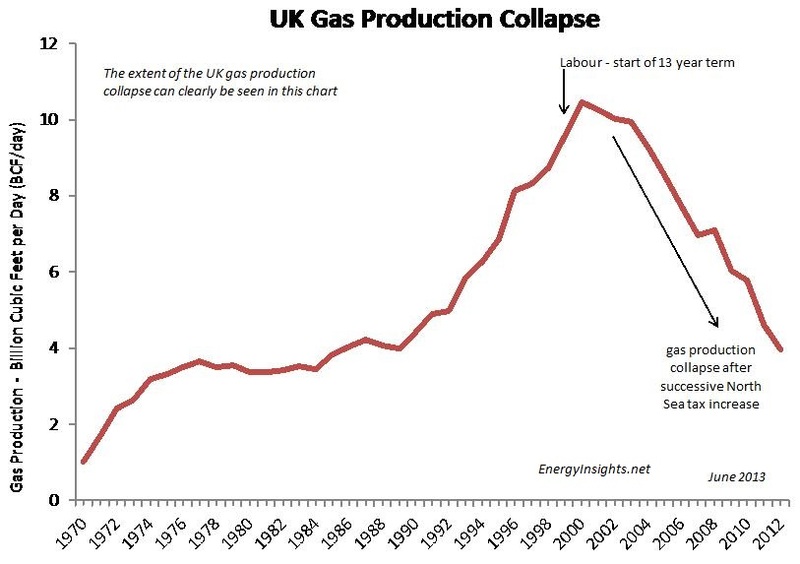 UK Gas Production Collapse - this chart clearly shows the extent of the gas production collapse - successive tax increase have not helped. Price Contrast: We now have a situation where UK gas prices are about $10/mmbtu whilst they are 3½ times less in the USA at $2.8/mmbtu. We import 60% of our gas now, whilst the US is considering exporting via new LNG facilities to Europe. Our oil production continued to decline at -15% a year. Meanwhile the USA’s oil production is growing at 10% a year. The UK’s oil imports are increasing, the USA’s are declining. The UK deficit is increasing, the USA’s is declining. The UK talks of power outages in 3-5 years time. The US has no such issues and can build new clean gas fired power plants at low cost wherever they want. The UK’s manufacturing is in terminal decline hindered by high energy prices. The USA’s manufacturing is increasing using low cost energy (gas and power) sources. Gasoline: We also have a situation where petrol prices in the UK are 3 times higher than in the USA. The tax take on petrol is 80% in the UK whilst it is 20% in the USA. The UK Treasury also takes >50% of North Sea oil revenues through tax, so that means the UK citizens pays over 90% tax on their petrol. A Sorry Tale: It’s a deeply sorry tale for the UK. As the UK population continues to complain about any onshore drilling – they also continue to complain about high energy prices and petrol prices. The bottom line is – you can’t have it both ways. Meanwhile the Labour party make political mileage out of the issue – when it was Ed Milliband that put the policy of renewable price quotas in place when he was Energy Minister and the Labour party increased North Sea taxes twice whilst selling most of the UK gold at “Browns Bottom” $220/ounce in 2003 – price now $1330/ounce during the economic boom period of high oil revenues when we least needed to. Sharing of Good Practices: So what does this US energy revolution mean for the rest of the world. We expect the learnings – e.g. the techniques, technology, procedures and good practices – of shale-oil and shale-gas exploration and production to be fairly rapidly applied around the world to boost gas and oil production. This should help keep a lid on oil and gas prices. Oil Importers Suffer: Many oil producing countries are in decline – such as Syria, Egypt, Nigeria and Venezuela. It is unlikely to help these countries that have political risk and capital constraints. China will try its hardest to used these methods to boost its gas and oil indigenous supplies. Russia will probably go slow with these technique because it tends to compete with its huge conventional oil and gas production – but it will probably eventually join in to boost its production-reserves of shale-oil and shale-gas. Overall, the wave of learnings from the USA will ripple through countries that can accept the environmental risks and have large tracts of flat land with low density of population that can be easily develop such reserves. Australia is an example of the country that could see onshore oil-gas production rise sharply using such techniques. Oil and gas importers have the opposite – non of these benefits. Any wander why Texas and North Dakota economies are booming along with their house prices. High Cost Wont Change Now: One of the key things is that shale-oil and shale-gas development and production is high cost – normally >$60/bbl is required to make these methods economic. This should keep oil prices from dropping sharply. The bottom lines is – these new methods will keep oil prices from rising sharply or declining sharply – it’s the end of cheap oil – its Peak Cheap oil – but not Peak Oil yet. As energy investment levels increase and costs rise, the oil towns and cities will be the winners, with countries with high cost oil imports the losers. So Greece, Spain and Portugal for example will all struggle, whilst the USA, Norway, Russia, Australia and Canada will see their economies improving. The big oil and gas producing countries will see huge benefits, but the big importers will have increasing deficits, increasing indebtedness, rising energy costs and lower living standards – yes, we are taking about the UK here as well regrettably. Only London (within 50 miles) and Aberdeen (within 30 miles) will see real positive benefits from this global energy situation – these are the only two cities that will see above trend property price increases as energy prices rise in the UK. Economic Impact - USA: For a country like the USA with decreasing reliance on foreign oil and gas imports – energy prices drop, inflation drops and this keep a lid on interest rates and supports stronger GDP growth. Unemployment will be lower, the currency will be stronger – and this will also lead to lower import prices. House prices are then likely to rise faster in a sustainable manner. Economic Impact – UK: For a country like the UK with an increase reliance on expensive foreign oil and gas imports – energy prices rise, inflation rises and this is likely to lead to interest rates rising that then suppresses GDP growth. Unemployment will be higher, the currency well be weaker – and this will also lead to higher import prices – a vicious circle. House prices are then likely to remain in the doldrums in most areas. If CO2 is having such an impact on the climate, why have temperatures been stable or declined globally in the last ten years? Oil and gas production-facilities have a very small footprint compared to coal – just think – have you ever seen or noticed an oil or gas field? Sugar and corn conversion into ethanol for use as a transportation fuel is one of the worst environmental ideas – because it is so energy, land and water intensive to produce these crops, with agricultural land that should be used to grow food to feed expanding populations. Sometimes the land is even created by clearing the rainforests - thence reducing moisture and oxygen emissions levels. Man Made Changes: There are so many pressures on the environment with a doubling of the global population in the last 50 years – and this is set to continue. It’s yet to be proven whether there is any meaningful warming of the climate, and if so, whether it is caused by CO2 emissions, a reduction in particulate pollution levels, reduction in the rainforests, increased agriculture, airline trails or any other man-made change to the globe. Billions have be spend researching CO2 emissions – many people believe it’s been a complete waste of public funds. We believe as populations increase, food prices increase, water shortages become more intense and energy prices stay high - that the key issues in the next 20 years will be how to create healthy, educated, secure societies - rather than worrying about CO2 levels. We need to feed 7 billion people and prevent wars, so anything we can do to reduce the cost of energy by boosting supply in an environmentally conscious way will help. Regrettably most renewables sources are double the cost of fossil fuels. Hydro-electric cheaper - but no-one will allow flooding of river valleys anymore - hydro-projects have almost come to a stand-still. We hope these insights have helped you get an appreciation of why the US economy will likely continue to growth at above trend rates whilst the UK will struggle against a back-drop of high energy prices from declining oil and gas activity and production because of the opposition to such developments. It’s going to be tough for households and inflation as energy prices continue to rise.